MTH Operating Reefer cars must be activated on a special activation track section sometimes called an Unload-Uncouple section or a UCS. But what if you want to activate it at some arbitrary location on the layout? Electric Railroad makes commander modules that you can install in the reefer that provides remote control if you have a TMCC command system. The modules are about $40 and requires some degree of wiring and assembly skill so it's not plug-and-play. But what if you don't use TMCC? Or what if you use DCS as your command system and don't want to invest in both command systems? There are two ways to supply power to the reefer's gearmotor mechanism. You can throw the "Unload" lever switch. In doing so for about 2 seconds, the internal reefer microswitch opens and takes over applying power (which is the 2nd way) to the mechanism until the door closes. 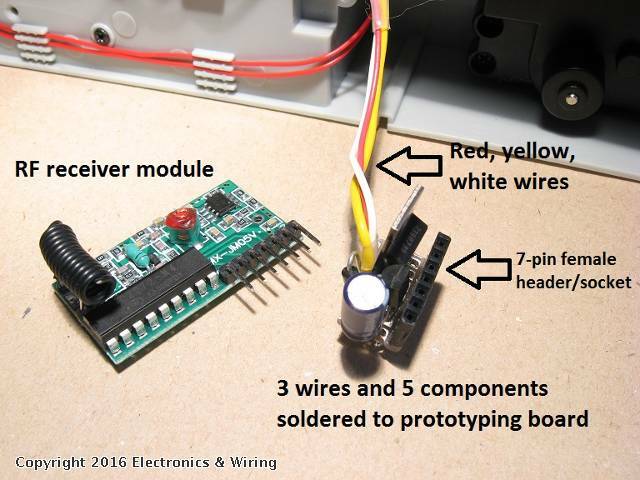 So to create a remote controlled proxy for the "Unload" lever switch, this topic shows how to add a 3rd way to power the mechanism. For about $5 in parts on eBay, you can get a remote-controlled wireless RF fob transmitter, a corresponding RF receiver, and a handful of component parts that will do the trick. Direct eBay links become stale and turn into errors; so this being an archive forum suffice it to say that by searching on eBay for the words/terms shown you will quickly find the relevant items. 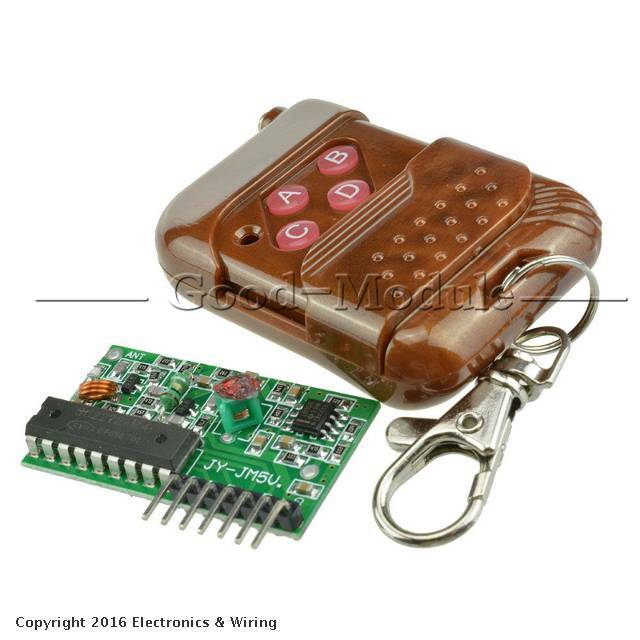 The key item is the 4-channel RF wireless remote control transmitter and receiver module. Simply put, you install a 12V type A23 battery in the remote transmitter. There are 4 buttons on the remote. 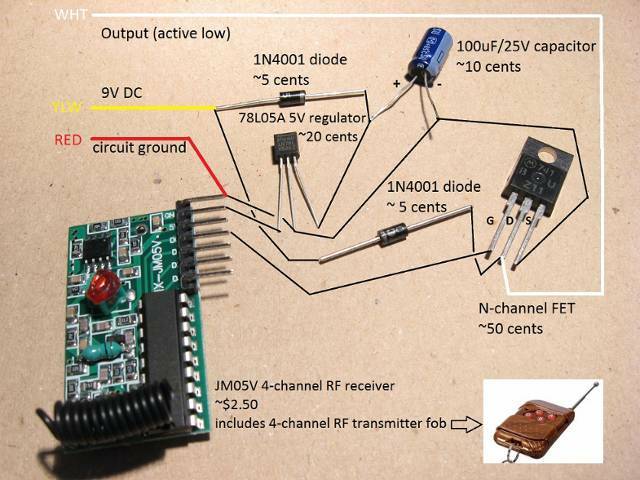 The receiver is powered by 5V DC. When one of the 4 buttons is pressed, one of the 4 pins on the receiver goes from 0V to 5V. To tap into the existing circuit, you only need to attach 3 wires to the existing reefer electronics. You do not have to modify the reefer's existing circuit board. 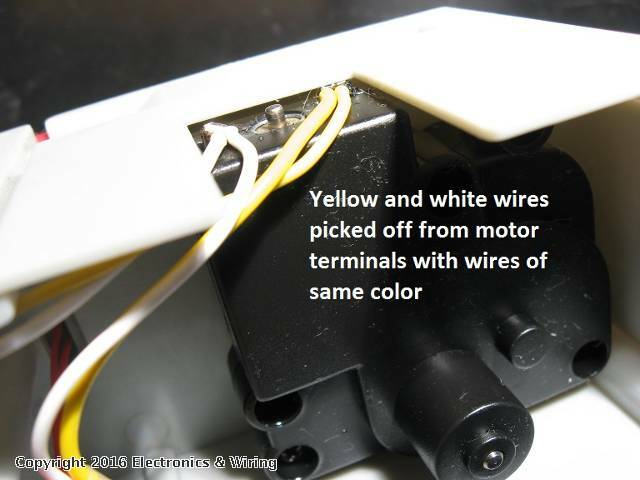 2 wires (yellow and white) can be picked off from the gearmotor mechanism. 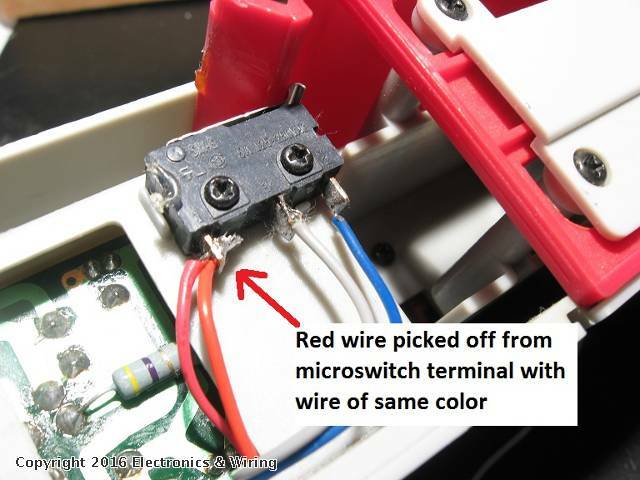 1 wire (red) can be picked off of the door microswitch. When a button is pressed, one of the 4 outputs of the receiver modules goes "high" (to 5V). This signal drive a N-FET power transistor which applies power to the gearmotor mechanism to start the action. There are hundreds of suitable FET devices. The photo shows a BUZ11 though it is now obsolete and may be hard to find - I happened to have a bag of them. At the time of this writing, popular parts readily available on eBay for 25-50 cents are the IRF520 or the IRFZ44. There is a cavity on the reefer next to the gearmotor that is large enough to insert the new electronics. Note that some MTH operating reefers have a smoke unit on/off switch on the chassis. 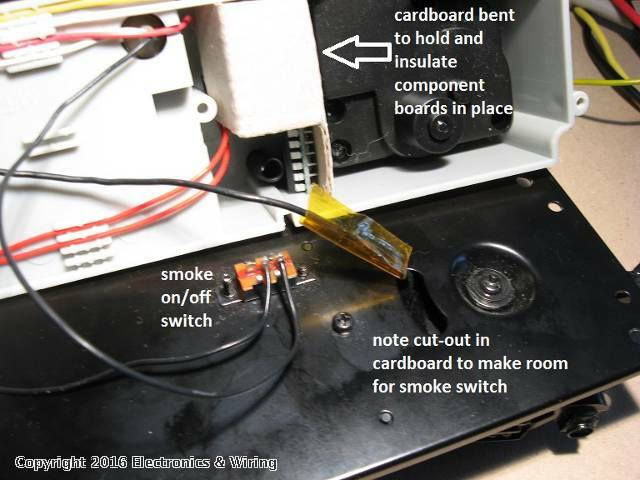 So think through how to orient the added electronics to fit in with the smoke switch. The existing reefer electronics is a 9V DC circuit using 7809 type voltage regulator ICs. When active the gearmotor mechanism draws about 100 mA. If smoke is turned on, the circuit draws about 500 mA. The added receiver circuit converts the 9V DC to 5V DC using the 78L05A regulator IC. The added burden is negligible (less than 10 mA). The circuit does not affect existing operation so the reefer can still be used with a track-activation section. The photos and diagrams show a 4-channel transmitter/receiver. 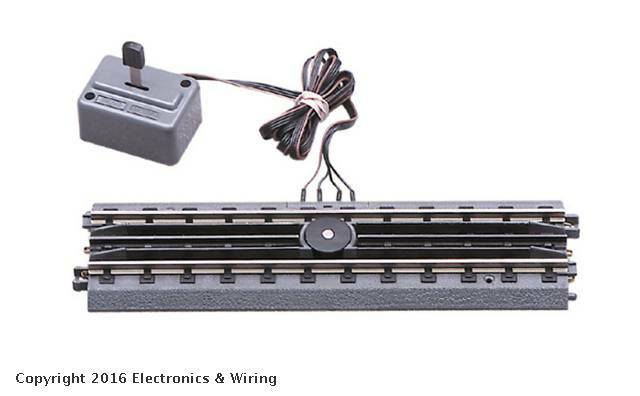 The idea is you may want to use the other 3 channels to control other rolling stock. There are eBay wireless receiver modules that include a relay if that is better suited to activate your device. 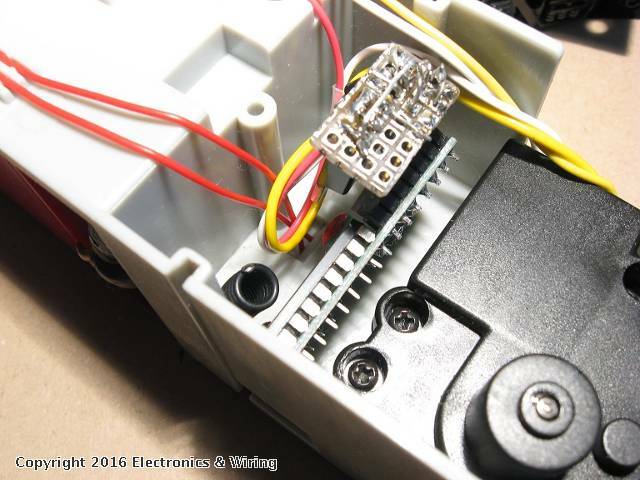 The wireless fob transmitter is readily dis-assembled revealing there are 4 momentary push-button switches inside. These push-button switches can be wired to a MTH AIU so that you can activate the MTH reefers using the DCS handheld remote (rather than the eBay transmitter fob). In this case you would use the "ACT" softkey button on the DCS remote which closes a relay on the AIU accessory output for as long as the "ACT" softkey is pressed. If you are using DCS, there is anecdotal evidence that you must add a 22uH (microhenry) inductor/choke in-line with the power coming from the wheel truck. The electronics in animated operating cars can reduce the integrity of the DCS command control signal which is sent over the rails. The remote control modification presented here does not affect the need (or not) for this inductor/choke. Stan you are my favorite kind of genius. I mean you're obviously brilliant, but it's more than just that: you're scrappy. You like to build everything from the simplest and most readily-available components - settling for bundled products only when they are either ubiquitous (i.e. like a 555 timer chip), or so cheap it's a no-brainer. Not only are you capable of doing these wonderful projects, but you are also so excellent at explaining them to laymen like myself and others. Thank you so much for taking the time to put this topic together. I love the way you think!